Books have margins. So do roads and highways. But sometimes, our lives just don’t include much margin. Whether its our finances or our schedule and commitments, we don’t intentionally live with space between our load and our limit. But God gave us instructions on how to order our lives in a way that gives us the reserve we need to be ready to live on mission with him. 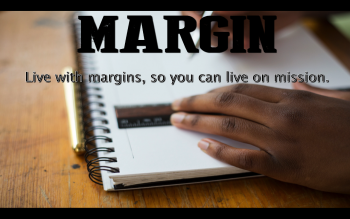 Join us for this important teaching series and see what areas in your life God wants you to create margin. The new series kicks off Sunday January 8, 2017, 11 a.m. at 4862 Broadway (2nd floor, auditorium).